The Beekman 1802 Heirloom Dessert Cookbook will show off the delicious and decadent recipes that the Beekman Boys have collected from across the generations of their family, from Brent's grandmother's Fourth of July Fruitcake to Josh's mother's Hot Chocolate Dumplings. Thanks for looking at our item! Have a look at the pictures and please don’t hesitate to ask questions! At 4W Enterprises we try to run our business by the “Golden Rule” and will describe our items as completely and fairly as we can. If you like what we do... give us a good rating. If you don't… please contact us so we can get your problem resolved. Our goal is to keep you happy so don't hesitate to contact us regarding any questions or problems you may have. Thank You Again! The Wallace Family All Shipping Outside the United States Is Done Through EBAY Global Shipping Program Shipping & Handling Free Shipping Sales are for the Continental USA Only Additional fees may apply for residents of Alaska, Hawaii and US Territories. Trending at C $5.34eBay determines this price through a machine-learned model of the product's sale prices within the last 90 days. Together they are the authors of three previous cookooks (The Beekman 1802 Heirloom Cookbook, The Beekman 1802 Heirloom Dessert Cookbook, and The Beekman 1802 Heirloom Vegetable Cookbook) and publish Beekman 1802 Almanac, a quarterly magazine. He and his partnerisi. Health & Beauty. Format Hardcover. 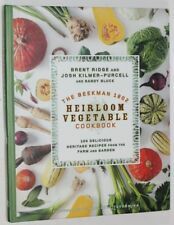 The Beekman 1802 Heirloom Vegetable Cookbook. The Beekman 1802 Heirloom Cookbook. The Fabulous Beekman Boys. More than 100 Recipes. Light shelf wear along the edges and corners. The book has a lot going for it. Trending at C $5.56eBay determines this price through a machine-learned model of the product's sale prices within the last 90 days. This hardcover book is NEW. We'll also send it directly to your gift recipient. Cover has some rubbing and edge wear. Access codes, CD's, and other accessories may not be included. All items ship Mon-Fri. International Buyers - Please Note: Import duties, taxes, and charges are not included in the item price or shipping cost. These charges are the buyer's responsibility. Please check with your country's customs office to determine what these additional costs will be prior to bidding or buying. List Price (MSRP): 32.50. Pages: 272. Publisher: Rodale Books.